The president’s refurbished house reveals a storied past. If the brick Greek revival mansion at 1925 F Street could talk, it would have quite a story to tell. Within the walls of its famed salon, presidents, policymakers, journalists, and countless members of Congress dined and deliberated the nation’s most pressing matters, from the founding of NATO to the ownership of the Panama Canal. Long before it flew the GW flag, the three-story building was a Civil War office, a private residence, and a place for Washington’s elite to sip cocktails and socialize. Today, this house of many milestones is home to GW President Steven Knapp. The first GW president to have a permanent residence on the Foggy Bottom Campus, Dr. Knapp and his wife, Diane Robinson Knapp, say they are committed to restoring the F Street House as a gathering place. Since moving into the house last year, the Knapps have hosted luncheons, dinners, and other receptions for the GW community and distinguished visitors, ensuring the house will continue to be a fixture for private but spirited conversations on issues of social, cultural, and intellectual importance to the University and the world beyond. During the Civil War, the house was used as the Office of the Commissary-General of Prisoners and became part of the Union Army headquarters. This photo was taken circa 1864. Step inside its white-framed door and feel history unfold. 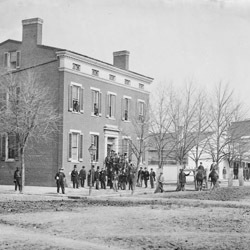 Built in 1849 for U.S. Navy Captain Charles Steedman, the F Street House was used as the Office of the Commissary-General of Prisoners during the Civil War and became part of the Union Army headquarters. It was sold in 1868 to Washington businessman Alexander Ray, owner of Ray Mill in Georgetown and one of the largest Georgetown waterfront landholders, and it remained in his family until the early years of the 20th century. 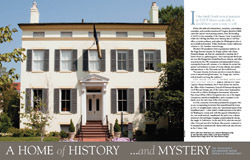 In 1920, American University purchased the property with an eye on expanding downtown but instead leased the home in 1923 to socialite Laura Curtis, the “uncrowned queen of the Republican party.” Curtis hosted countless parties in the salon for Washington society and, with the support of hundreds in her vast social network, transformed the parlor into a dinner and social club and began charging a membership fee during the height of Prohibition. In the mid-1930s, after she married John Gross and moved to his home, the property continued to be managed as a members-only dinner and social place known as the F Street Club. After a year of remodeling, President Steven Knapp and his wife, Diane Robinson Knapp, moved into the F Street House in 2008. Modern improvements include disability access, energy-efficient windows, a private outdoor terrace, and a green roof. To maintain the tradition of the F Street House, professional photography of the house’s interior is not allowed. In the late 1950s, Vice President Richard Nixon brought his Soviet counterpart there to debate the Cold War. After President John F. Kennedy’s assassination, friends of Jackie Kennedy held a cocktail party at the club to comfort the widow. And in 1980, President-elect Ronald Reagan chose the club as the site of a candlelight dinner to introduce himself and his wife, Nancy, to Washington society. Presidents Jimmy Carter, George H.W. Bush, and Bill Clinton all attended events at the club. Make yourself comfortable, and stay awhile. 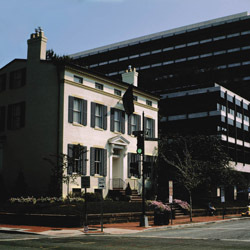 GW continued the F Street Club tradition after purchasing the property in 1974, and the mansion was added to the National Register of Historic Places in 1990. In 1999, the F Street Club closed. Staying true to the mansion’s tradition as a place for friends to gather and share ideas, GW rededicated the building as its Alumni House. The historic structure became home to GW’s 16th president, Steven Knapp, and his wife, Diane Robinson Knapp, in 2008 when they said they wanted to be an integral part of campus life and the Foggy Bottom community. Renovations preserve the home’s distinguished heritage while incorporating sustainability measures.